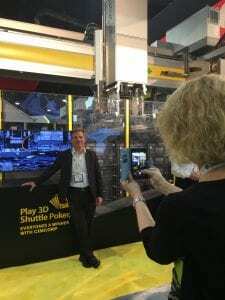 Building Media Relationships and Cultivating Facetime - DPR Group, Inc.
Cimcorp North America President Rick Trigatti poses for a photo during an on-site interview with Inside Logistics at MODEX 2018 in Atlanta. An inspired and precisely executed public relations push before, during and after an industry trade show is essential to ensure the maximum return on investment during an event and to reap the rewards of media exposure. That’s why PR is a critical component of trade show planning. While capturing new sales leads and prospects is a high priority, securing media coverage should be a paramount goal for any company exhibiting at a trade show. The companies that succeed are almost always the ones with one or more smart, experienced and determined PR professionals on hand to attract, capture and hold the media’s attention. For four days last April, the Georgia World Congress Center in Atlanta became the center of the supply chain industry universe when it hosted MODEX 2018. Showcasing the latest manufacturing, distribution and supply chain solutions in the materials handling and logistics industry, the event boasted a record 28,000 attendees from more than 800 companies. Every company in attendance at MODEX 2018 had the same burning desire – to be noticed as the brightest star amid a vast constellation of competitors. Two of MODEX’s 28,000 attendees were DPR Group Account Executive, Edward Lin, and then Vice President of Marketing and Operations, Liz Palm. While Liz was at MODEX to serve as a brand ambassador for DPR Group, Edward attended the show on behalf of Cimcorp. Headquartered in Finland, with offices in Canada and the United States, Cimcorp has built and installed over 2,500 logistics automation solutions in 40 countries across six continents. Onsite at MODEX, Edward’s primary mission as Cimcorp’s envoy was to build brand awareness and cultivate meaningful relationships among trade press, editors and journalists. Press coverage can capture a prospective customer’s attention and elevate our clients to the short list of the prospect’s buying cycle. Effective PR pros don’t just fire off a press release, stand in front of the company’s exhibit booth and wait for editors to appear. Edward invested time in advance to research the media players, coordinate-face-to-face meetings, network, create a message and develop a strategy to promote Cimcorp. “The biggest thing is to get that facetime with the journalists. I think meeting face-to-face leaves a strong impression on editors. In the age of internet-driven PR and marketing when even phone calls are starting to dwindle down, establishing a personal relationship is critical,” says Edward. While at MODEX, Edward also had important, and all too rare, face-to-face interaction with his Cimcorp colleagues, including a strategy meeting with Cimcorp marketing team members from North America and Finland. When considering exhibitor fees, travel and lodging expenses, and time spent in preparation, MODEX, ProMat and other trade shows represent a significant investment for any company. The costs can be hard to justify, but if you prepare properly and partner with a PR and marketing agency that really knows the industry, the added value of media exposure and ongoing press coverage will greatly enhance your ROI. Out of the conversations with numerous journalists at MODEX, Cimcorp was able to gain several interviews, bylined article opportunities and featured stories in high-profile publications in the materials handling and supply chain spaces. Charles Wisniowski is DPR Group’s Marketing Writer.